WHAT: Malibu/Lost Hills Sheriff’s Station Open House. WHEN: Saturday, November 3, 2018, 10:00 a.m. to 3:00 p.m.
WHERE: Malibu/Lost Hills Station, 27050 Agoura Road, Agoura. 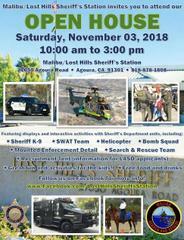 Anyone wanting to get an inside look at a sheriff’s station, climb on a fire truck, or sit behind the wheel of a patrol vehicle, will want to visit the Malibu/Lost Hills Sheriff’s Station Annual Open house, Saturday, November 3, 2018, from 10:00 a.m. to 3:00 p.m. Kids can climb in patrol cars, sit on police motorcycles, and hop on a fire truck from the Los Angeles County Fire Department, all while enjoying something to eat at this family event. Among other attractions at this free event, will be members of the Special Enforcement Bureau (SWAT) team, a K-9 unit, the Mounted Enforcement Detail and Sheriff’s Posse with their horses, a bomb squad display, and many other Department specialized units. Tours of the station, including an inside look at the jail will be conducted throughout the day. The Malibu Search & Rescue Team will be on scene with a dynamic display, including zip lines that visitors can experience. In addition, members of the Los Angeles County Sheriff’s Department Recruitment Unit will be on hand to provide information on how to join the Department. Members from our Reserve Unit, Search & Rescue, Posse, Explorers, and the Volunteer program will be available to discuss their units as well. This open house is just one event that highlights the Los Angeles County Sheriff’s Department’s community policing efforts. This is an opportunity for the members of the community and public safety to showcase their support of each other. For additional information, contact Deputy Mike Ranes, Lost Hills Station at 818-878-1808.